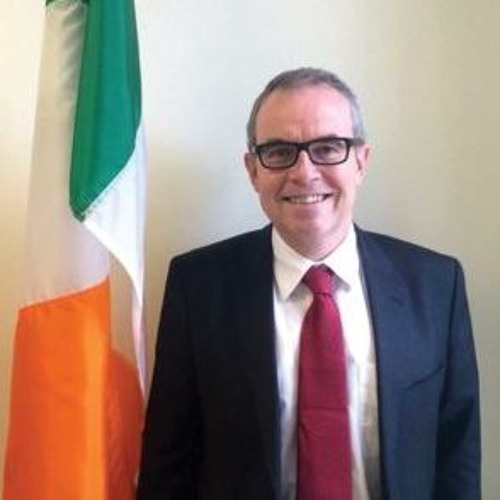 Jim Kelly became Ambassador of Ireland to Canada in August 2016. He presented his credentials to the Governor General, His Excellency the Right Honourable David Johnson at Rideau Hall, Ottawa, on 6th September 2016. The Embassy of Ireland is also accredited to Jamaica and the Bahamas and Ambassador Kelly expects to present his credentials in both countries in early 2017. Welcome to the website of the Embassy of Ireland to Canada. I hope that you will find it a useful resource, one which will help ensure a greater appreciation of the relationship between Ireland and Canada and the services that the Embassy provides. Diplomacy has always been more than just a job to me. It is a true honour and privilege to represent Ireland and to serve the Irish people and their interests at home or abroad. This is ever more the case when it comes to representing Ireland in Canada, an extraordinary country with whom we have always had such deep and strong bonds of friendship, and which has provided a home away from home for Irish people for centuries. Canada and Ireland have worked closely on international issues over many years in the context of our shared membership of the UN. As two open trading economies, with a strong shared commitment to a rules based international order, we have a similar world view and much to learn from each other. The value of annual trade between our two countries is estimated at approximately €2.5bn, and with both of our economics growing and the new EU-Canada Comprehensive Economic Trade Agreement close to finalisation, there is considerable potential for an expansion in our trade. During my time in Canada, I look forward to working with my colleagues here at the Embassy and in the State Agencies to cement and further developing our warm relations, and to build closer economic, political, cultural and people-to-people links between our two countries. I also look forward to travelling this great country and meeting as many of you as possible over the coming years. Ambassador Jim Kelly was born in Dublin in 1965. His wife Anne Martin, who is a native of Co. Limerick, has joined him in Ottawa together with their two daughters, Orla and Ciara. The balance of his diplomatic career to date has been spent at the Department of Foreign Affairs at HQ in Dublin where he has held a wide range of positions covering different areas of the Department’s work. These have included a series of assignments with the Department’s Political, European and Development Cooperation Divisions. He commenced his career in DFA in November 1993 with a formative one year assignment in the Anglo-Irish Division, dealing with Northern Ireland issues during the period of the 1994 paramilitary ceasefires which opened the way to the Good Friday Agreement of 1998 and a new era of peace and cooperation on the island of Ireland. Most recently, Ambassador Kelly established and directed the new Policy Planning function at the Foreign Ministry, where he led policy development on key issues such as the implications of Brexit for Ireland, and Ireland’s response to the refugee and migration crisis. Before joining the Ministry in 1993, he worked as a consultant with the leading global professional services firm, Accenture, and prior to that he held civil service positions in the Department of Energy and the Revenue Commissioners in Dublin. He attended primary and secondary school at Drimnagh Castle CBS in Dublin, and is a graduate of University College Dublin (B. Comms (Hons) 1990). He enjoys running, hillwalking, reading; political, social and military history; music and cinema. He is also a keen follower of most sports, particularly Gaelic games. Ambassador Kelly served as a Member of the Royal Irish Academy’s International Affairs Committee, 2014-16. and as Vice Chair of the United Nations General Assembly’s Fourth Committee, (Political and Decolonization) during the 66th session (2011-12). He was the first Irish diplomat to be nominated to participate in the US State Department’s International Visitor Leadership course in 2007. English (mother tongue), Irish (operational), French (basic), Danish (basic).